We live in Alaska, we hunt sheep in Alaska, but sometimes we must live vicariously through our neighbors who hunt sheep in Canada. Alaska does not have many “stone” sheep….if any. This hunt by Aaron Parrotta is an inspiration that took part deep in the heart Canadian backcountry. Congrats gentlemen. 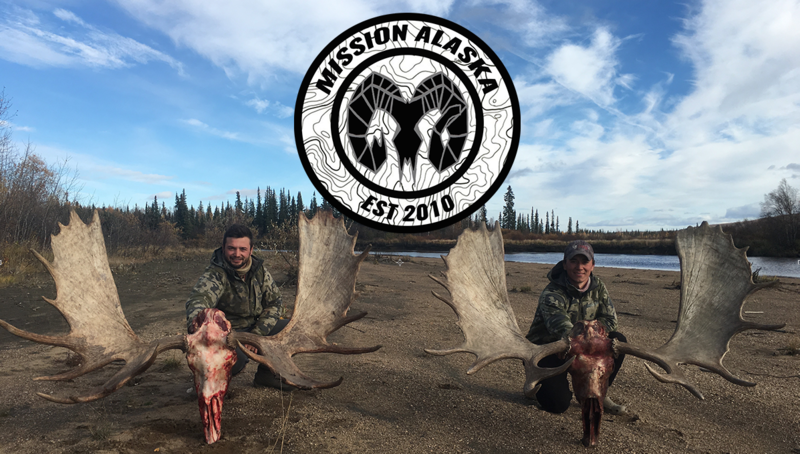 Our hunt started on August 9th, 2016. After a long hike in we reached our camp spot late in the evening. This year we had studied more maps and hoped to venture further into uncharted territory for us, preparing to sleep under a siltarp if we had to. The morning approached quickly and the weather looked fantastic this year. We ate breakfast and readied our packs for a long days journey. Our legs were a bit sore from the previous day, but we were so excited to see what 2016 had to offer! Knowing the routine of stop, glass, stop, glass……we picked apart the mountains. Three hours into our hike we spotted a Ram and Ewe bedded in the rocks below us. At first glance the Ram looked decent. Quickly removing ourselves from their sight we set up spotters to evaluate him. All we could get on age was 7 and horn tips to the bridge, but too close for comfort. He looked like he needed more years. We both had great rams already so agreed not to spend any more time on him. We pressed onward, spotting young rams, ewes and lambs bedding high on the mountain spines. Over a kilometer away, we spotted a Ram sky lining which only had one horn. We would have loved a closer look at him but knew it was too far to travel that day. The next rams were not spotted till around 5pm. There were three bedded on the mountain top. Only one of the Three was a contender. We figured they should be getting up to feed soon so we settled in. After an hour they stood and started their journey to the valley bottom, stopping to feed along the way. We watched to see where they would end up for us to have a better view. The ram we wanted a better look at led the way, not wasting much time to get to the bottom. We decided to circle around out of sight down to the bottom as well. We figured this would get us a more square on look. Once on the bottom, with the ram in our spotter, we could only count seven years. Since he never stopped moving it was really hard to get horn length. We needed to get closer but would have to be in their sight for about 300 yards. We decided to try, as it was getting late, knowing that if they saw us they would head high again. Sure enough, with their incredible vision they were onto us and started feeding their way back to the top. It did not upset us as our views of him did not tell us he was a “no brainer”. Happy with the sheep numbers and excitement we had on day one we started our long hike back to camp. The next day we spotted sheep early, mostly ewes and lambs and the odd small rams. We decided this was the day to venture into some new country. Not far on route, a long way below us, we spotted three bedded rams on the edge of a basin. We continued along the ridge to get a better view into the basin to see if more rams were in there. Once in position we peeked over the ridge. Sure enough there were a pile of rams, around 20!!!! It looked like a sheep estuary!!! Our eyes lit up, knowing there would have to be at least two legal rams in this group. We ruled out the rams that were definitely not legal and the few we needed a closer look at. Now in the afternoon, we both agreed we did not have time to get closer as the were about 2000ft below us. We decided to keep assessing the valleys around them to familiarize ourselves with their possible escape routes. We then hiked back and put them to bed and planned a strategy for the morning. It was going to be a sleepless night!!! In the morning we were excited to open the tent to a bluebird day! With pep in our steps we started our hike to the basin. Once there, it did not take us long to spot some rams as they were 100 yards from where we left them. We proceeded to our sneak plan completely out of sight of any rams. Knowing that the more rams the more eyes we made sure we were totally blind to all of them! The weather and wind were perfect. We had picked out a ram bedded above the rest on the hillside. Upon viewing he gave us a perfect square look and his horns were at least 1-1.5″ above his bridge. His age rings were a bit more challenging , definitely seven years old, possibly 8. This ram then got up and started feeding down towards the big group out of our sight. Knowing he was legal with a very distinct white head for easy identification we turned our attention to one of the lower rams. He was heavy horned and did not take us long to count eight rings. The rest of the rams we could see were all younger but with a few beauty up and comers in the band. We decided which rams we personally wanted if we could make it happen. That was two legal rams, now how to bring it all together? We then started looking for Andrew’s ram as they came out single file up into the cliffs. We could not see it! We never did get eyes on the ram once he dropped down low 45 minutes before, but we were 100% confident that he was still within reach. We decided that I would stay low and Andrew would go up and see if his ram went to the other the other ‘blind’ side of the drainage. It was a shear drop off directly below us so we could not see the bottom of the cliff if they happened to stay tight to it. Half an hour passed with no sight of Andrew’s ram. I decided to drop the odd rock off the cliff to see if they were against it. Sure enough, his ram and another came out and proceeded up the small cliff area right in Andrew’s direction. Once they were out of sight I hiked up to Andrew to tell him they were coming. Andrew had a great spot picked out that they could not sneak by. I then went back down to make sure they did not double back. When I got down I found the rams again bedded on a little outcrop. I made sure that they had seen me and they rose and started again towards Andrew. I was almost back to Andrew when I heard the shot. I then saw him stand with a fist pump saying “dropped him at 375 yards! “. Unbelievably, It all came together!!! We had just completed our second double header together!!! Now the work begins!! We arrived back to camp after 10 pm, ate dinner and straight to bed. Were we ever sore!! The next day, with the sun out once again, we turned and salted capes. We ate lots and refueled for our long, heavy pack out the following day. Preparing for bed Andrew was putting his pack cover on his bag preparing for the occasional overnight sprinkle. He pulled it and one of the elastic cinch cords must have been stuck under a rock. It came flying out and hit him in the left eye. Immediately his eye started filling with blood under his pupil. He was 100% blind in one eye and watched me ‘disappear moments after the hit. Such a scary feeling loosing sight with no depth perception with one eye! All he could do was go to bed and rest his eye, hoping that some of the blood in his iris would clear by morning. Morning came and he still had no vision. We packed up and started our long hike out first down about 2000ft of technical rock. He just followed close to me as I picked the safest route out. I felt so bad for him because he went from super stoked to the wind ripping his sails. We made it out and proceeded straight for Fort Nelson hospital. The hospital told him he had torn his iris. They lined up a specialist for him in Prince George hospital. Once in PG the specialist told him that it was torn but would heal itself in a months time. With some comforting news, we proceeded home reminiscing on such a fantastic day. Showing the reality of how easy and scary it is for accidents to happen way in the back country. All in all it was and incredible hunt with many sweet memories logged. I could not ask for a better sheep-hunting partner that perseveres thru so much pain. Knowing each other’s limits and expectations are the most important aspects of choosing a sheep-hunting partner. Looking forward to next year already!! Many thanks to WSSBC for all you do to keep sheep on the mountains to feed our passion. Best of luck to all and be safe.